Oh, dear . . . Spring pattern catalogs are being released, and I still have a ton of winter sewing I want to get done before the weather changes. On the other hand, I am definitely getting sick of cold weather wear, so perhaps it is time to pull out the springtime florals! The new Retro Butterick reproduction is less than thrilling, and a pretty close copy of the recently released McCall 7086 from The Archive Collection. The striped illustration looks pretty darn cute, but it really is pretty basic and blah. Gertie’s recent obsession with dirndls is very evident with Butterick 6322, but it also reminds me very much of Vogue 8728. She also has a one shoulder dress that is nice, but the design is pretty basic and not tempting enough to make me drop my current sewing plans. The Lisette offerings are intriguing. But, in my opinion, there is something off with the petal bust detail on the dress – I think the center band has something to do with it. Maybe if the contrast flaps met at center front? Or perhaps in a single fabric I would like to the look better. But I do love this jacket. The back flap and elastic waistband is a little too sporty for my taste, but this design has some real possibilities. I have no idea what is going on with the styling, but the double breasted jacket is enough to make me overlook it. My favorite pattern, though, is Butterick 6320. No, not the jumpsuit - the dress version. The print hides the bodice style lines, but I really like the cap sleeved dress! 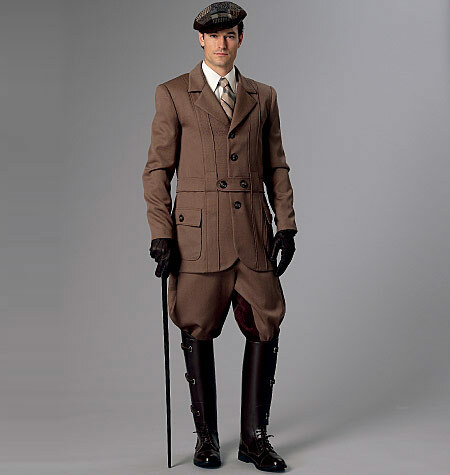 And if I could get away with wearing them, I think a pair of jodhpurs would be an awesome addition to the wardrobe. But, seeing as I am not a terribly chic 1930s English noblewoman with a country estate, I don't believe I can get away with puffy pants (I can't even pull off regular trousers). Thank goodness the pattern is made for men so there is no chance I will be tempted. The main issue now is, will I finish that wool coat on the sewing table in time to wear it before Spring and Summer sewing takes over? Only time will tell . . . I find it very hard to see past all of Gerties' tattoos to even check out her designs. It is so much sensory overload. Good business to get into - tattoo removal - will be in huge demand in ten years. Your inability to "see" past her tattoos sounds more like your own internal stuff that you're projecting on her. It's a shame that you're missing out on her cute pattern designs because of that judgemental attitude. I agree, i really think its distracting and clashes with the vintage look. Anyone that dislikes tattoos gets slammed though. How funny... I totally did NOT even notice the tattoos... I follow so many 'retro/pinup girls' on Instagram and most all of them have ink... Both dresses are swellagant though! I was less than wooed by the new patterns. Took a look and deleted the email. But I too like the jacket. Good luck with your coat! I like that jacket you mention, would be nice for spring/summer wear. and I saw a shirtdress that has potential, B6333 but otherwise it was kind of dull. Or maybe I just see how there are so many repeat shapes. I have the original version for B6322 had to size it up (wish they had let me know they were going to re-release it, would have saved me some work). I love it. Its very comfortable to wear and an easy sew. Oh heck yes, jodhpurs and a Norfolk jacket!? I don't care that it's a men's pattern, I'm getting in the car RIGHT NOW to go and buy it! 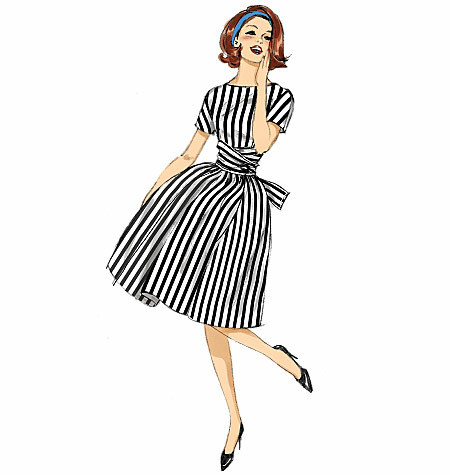 How funny that Butterick just released this pattern ... I have been planning myself a woman's Norfolk jacket, and the fabric arrived in the mail yesterday! Timing is prefect, though i can't use this particular pattern due to my body shspe. I finally decided to just use a regular blazer pattern (like Simplicity 2446) and add Norfolk details: the pleats down the front, the belt, the hip level patch pockets with flaps, maybe armpit gussets, etc. If anyone is interested, I have been collecting examples of a Norfolk details on a pinterest board:http://pin.it/ElGYEh6 ... happy sewing! I like B6320 as well- particularly the jumpsuit. And if I could get away with that men's coat, I totally would! 6320 works for me, that sweetheart neckline and all the seams offering shape and accentuating the female form. I think it is lovely. The dirndls, meh. Really, who on earth want to wear a dirndl other than to Octoberfest? My friends would laugh. I say put Gertie's dirndl in the costume section of the pattern book. I agree with you on B6321. If the neckline were a bit "sweetheart",making the faux lapels fall at a slant; and if the lapels met in the center, it would make a huge difference. It does tempt me. Thanks for sharing the pics and your opinions. Alright, stop right there, Laura Mae! You have worn, and can wear, trousers, beautifully. Your high waist, hip curve, and the length of your outseam all have conspired to fit and flatter. I think the ideal profile for you is a high waisted pant, to further lengthen your legs, and shorten your torso (a smidge). Whether full or slightly pegged, no doubt you'd compliment the pant with a side part or pin curls, to a pitch-perfect presentation. I like the jumpsuit but am not wowed by any of the patterns as I have a huge collection of Vogue designer patterns from the 60's and 70's which I think are superior to what is currently available. Peggy Carter's tulip sleeves seemed put in backwards. I absolutely adore the "basic and blah" Butterick 6318! I don't know if this has been mentioned anywhere but b6318 is an exact replica of vintage b9826. Which is good news for me because I've been waiting for a copy to pop up online. B6318 is very similar to a Simplicity #3769 I have from the same year...guess this is a rather common design. Give us something new and detailed Butterick! Love the historical men's jacket and jodhpurs, but if anyone wants a woman's version of the bottoms, I believe Past Patterns co. has some 1923 knickerbockers. Gertie's #6323 strikes me as having something missing. I've done a good amount of looking into one-shouldered dresses of the 40's and 50's, and most all of them have a creative method of adding on a second shoulder. Look at Simplicity #1605 - it uses a border print the way Gertie did, but I love the separates offered in the vintage pattern. If I do get her pattern I'll make changes to it. 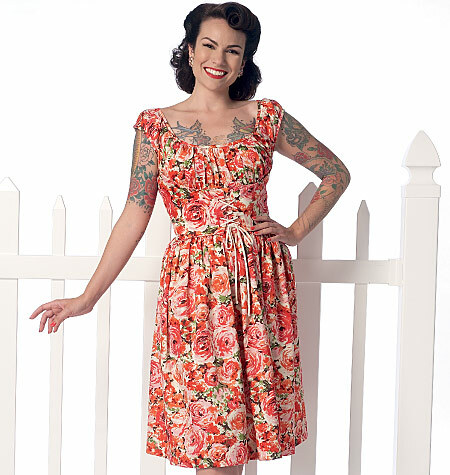 Butterick 6320 is also my favorite...perfect for my "Agent Carter-in-California" look! All it needs is a little center front 'window' triangle under the bust seams and a cranberry floral fabric to imitate her outfit in Season 2, episode 3.